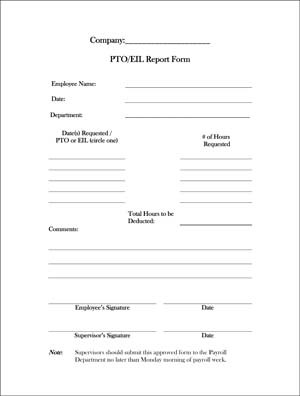 Get your free sample Printable PTO Request form to download for your small business or HR Department. The HR PTO Request Form below is to be used when an employee needs to request paid time off (PTO) for vacation, personal time off, etc. Normally PTO is accrued for 40 hour a week or full-time employees within the company. This will depend on your company’s policies. The form has to be signed by the employee and the employee’s supervisor before request is approved. The employee after approval or disapproval will receive a copy of the form then it will be turned into the Human Resources Department to be filed. Generally, PTO refers to a system which erases the difference between types of time off, gathering together various types of leave, personal days, and sometimes sick days. There are advantages to this such as you are treating your employees like grownups that are more than able to manage their bank of time off, you are giving your employees the capability of customizing their time off to meet their needs, and then your company will find fewer headaches not having to sort out and track different types of leave. Your Human Resources Department will be relieved of its responsibility as hall monitor and how employees prefer to use their time. There is a downside though of employees with PTO tend to use more time off, and the danger being that they run out of time by over-using their PTO. Employers are encountering these challenges and working on making them work more smoothly. As of right now, most employers prefer to let their employees use their PTO as they please. Revise your Employee Handbook and make sure everything agrees about accural of PTO. The Employee Handbook, the policies, and the payroll department procedures must all agree. It is important to draft company policies and handbooks carefully in the beginning, and update them from time to time to reflect what your company wants.